Can you believe it’s only a few more days till Christmas? Where has the time gone? We’ll if you’re like me you may need a last minute gift or just a little extra sparkle this holiday season. 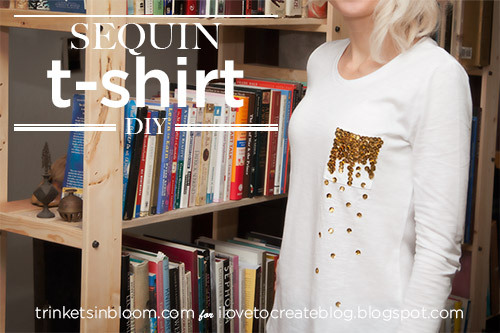 Create a DIY Sequin Tee in minutes with this ultra simple and inexpensive project. Using two of my favorite products; Aleene’s Jewel-it glue, it’s simply the best glue for adding sequins, rhinestones, beads you name it to fabric. And of course Tulip Fashion Sequins!!! Cause who doesn’t love to sparkle? If you’re ready to sparkle, lets go! This is a really simple and fun way to embellish a t-shirt. You can wash your t-shirt but just don’t put it in the dryer or you may lose a few sequins. For more DIY Fashion projects check out my blog Trinkets in Bloom! Thanks for watching and Merry Christmas! Very CUTE!!! and sooo easy. Love It. Thanks Cathy for sharing.